Cadbury is celebrating the move to fair trade chocolate with the launch of Glass and A Half Records, an album inspired by the music of Africa. The first single, “Zingolo”, celebrates all things Ghana, its people, its rappers, its dancers, its cultural figures and, of course, its cocoa beans. The campaign, including a 4:56 minute music video and a 30 second edit, follows on from the success of Gorilla, Hangar and Eyebrows at A Glass and Half Full Productions. A painter preparing a sign for Big Plant Cocoa Farm is surprised by a giant face which attracts cocoa pods. Down town the face sparks dancing, singing and celebration all round, featuring Tinny (Nii Addo Quaynor) one of Ghana’s biggest music stars, along with High Spirits, regarded as one of the country’s best dance troupes. The initiative is aimed at emphasising Cadbury’s 101 year-history of trading with Ghanaian cocoa farmers. Starring villagers of a Ghanian village, all proceeds from the Zingolo single at iTunes will go to charity Care, which works with the cocoa communities in Ghana. 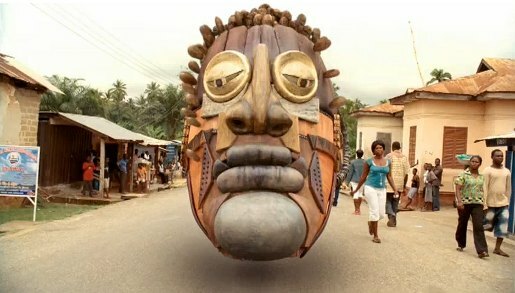 The campaign also features print ads designed and painted by Ghanaians using traditional Ghanaian techniques. Phil Rumbol, marketing director for Cadbury says: “We wanted to celebrate Cadbury Dairy Milk’s Fairtrade certification and Ghana, the heart of our Fairtrade cocoa, in a unique way. Music has always been a big part of Glass and a Half Full Productions and we were inspired by Ghana’s love of music so it seemed the perfect way to capture the spirit of the country was through a track. We hope we’ll bring a smile to people’s faces.” Cadbury Dairy milk is now Fairtrade in the UK and Ireland and will extend this to Canada Australia and New Zealand in 2010. The Zingolo campaign was developed at Fallon, London, by executive creative director Richard Flintham, creative directors Chris Bovill, John Allison, creatives Filip Tyden, Dan Watts, account director Nathalie Clarke, agency producer Tom Goodwin, executive producer Nicky Barnes and agency producer Gemma Knight. Filming was shot by director Ringan Ledwidge via Rattling Stick with producer Sally Humphries with director of photography Franz Lustig. Editor was Rich Orrick at Work Post. Post production was done at The Mill, London. Music was composed by Paul Epwort and produced by Alex Lavery and Simon Rose at Pitch & Sync. Audio post-production was produced by Parv Thind at Wave Studios. Media planner was Ellie Roberts at PHD.